HIV has historically disproportionately affected countries in Africa, with African countries accounting for 24 of the 25 countries with the highest HIV prevalence in 2016. Although HIV in the U.S. is not as prevalent or deadly as in Africa, the United States still reports more people living with HIV than its Western and Asian counterparts, with approximately 1.23 million people living with the virus as of 2016. 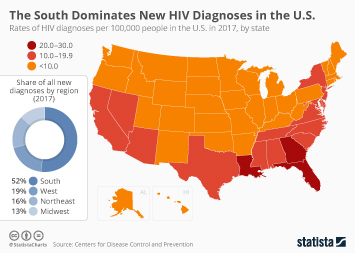 Within the United States there are also differences in HIV diagnoses by region, with the South consistently reporting higher levels of diagnoses between 2011 and 2016 than any other region of the U.S. In 2016, 6 of the 10 states with the highest rates of AIDS diagnoses were in the South of the United States. In that year the District of Columbia reported a diagnoses rate of 55.6 per 100,000 population, the most of any U.S. state, and far more than the second highest reported rate of 31.8 per 100,000 population in Georgia. Deaths by HIV in the U.S. have seen significant decreases since the 1990s. In 1995 there were about 16.2 deaths from HIV per 100,000 people in the U.S., while in 2015 that number was only 1.9 deaths per 100,000 people. However, the death rate among African Americans remains significantly higher than that of other races or ethnicities in the U.S. For example, while the death rate among those who were White was 2.5 per 100,000 population in 2015, the rate for African Americans was 17.5 per 100,000 population. With advances in treatment and education, fear surrounding HIV has decreased, with less than one percent of the population stating that AIDS was the most urgent health problem facing the U.S. in 2016. However, this does not mean that treatment and funding for HIV has become irrelevant. In 2016, U.S. federal HIV/AIDS grant funding totaled over 3.2 billion dollars, with the Ryan White Program contributing 2.1 billion dollars of this total.